Over the past few months, I’ve really focused on pinching pennies wherever I can. I’m the only person working right now in our home so saving money is one of my top priorities. It’s actually not as hard as I thought and it is, in fact, addicting! I always feel great when I discover an awesome deal. The Flipp app has been instrumental in helping me save money on groceries especially. One way I’m saving money is by price matching. A few months ago the word price matching was very fuzzy in my mind. I pictured that show Extreme Couponing and thought there was no way I’d ever have time for that or even the desire to try it. I couldn’t have been more wrong. Not only is it not time consuming, but its also quite simple! Today I want to share with you how I price match using the best free digital flyer app out there, Flipp! When you use Flipp, saving money is a breeze. 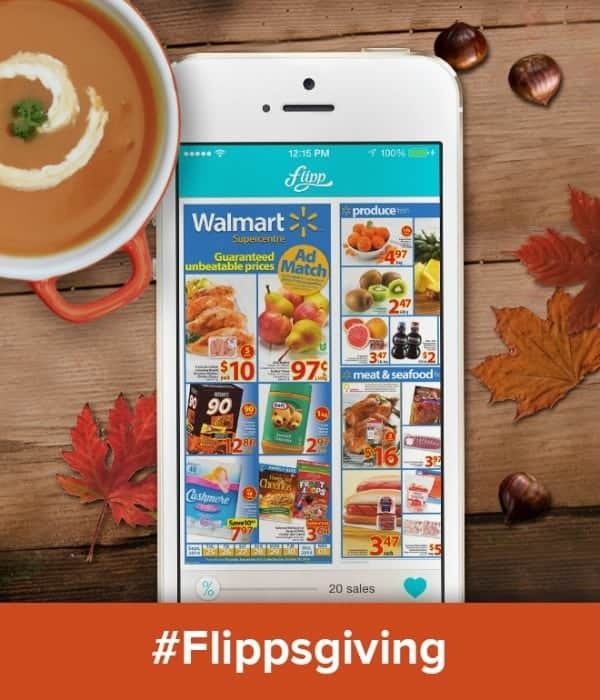 With Thanksgiving coming up soon, I recommend you use Flipp to save money on your grocery bill! 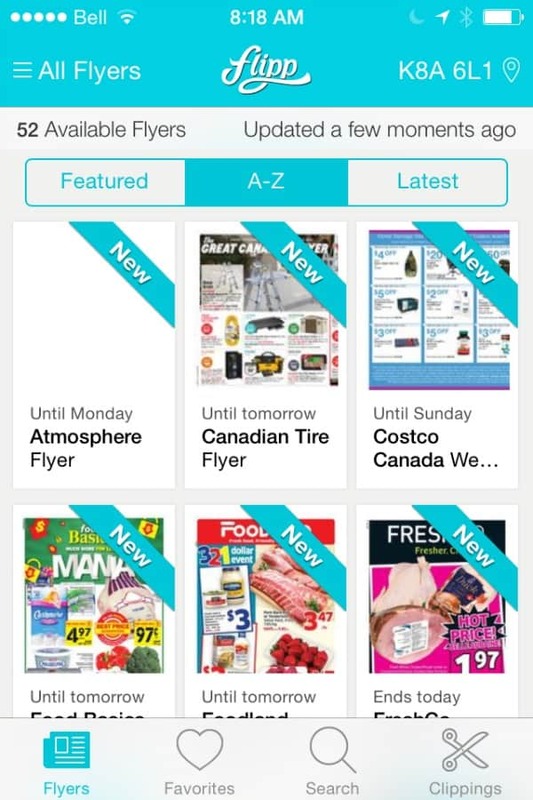 Flipp is a free app for your smartphone that allows you to easily browse flyers for stores across Canada. With a flick of your finger, you can quickly browse the stores you frequent, clip items you want to purchase and use it for price matching. After downloading Flipp, you’ll notice how intuitive it is to use. It’s really easy to use and find exactly what you are looking for within seconds. I clicked the heart to Favourite the flyers for stores I shop at frequently. This way I can look at them quickly and see what sales are on that particular week. 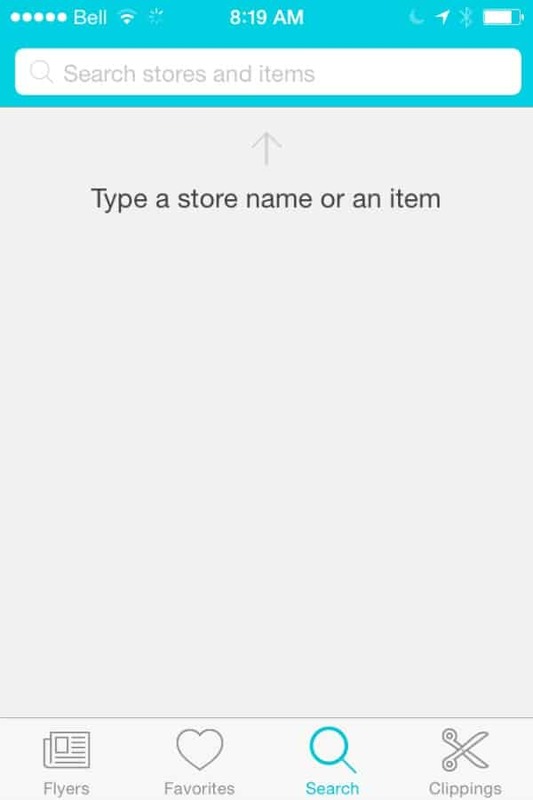 You can also type a store name or item you are searching for. If you want to see all the deals on chicken that week, use that term and see where the sales are. I also go through the flyers and clip the items I want to buy that week. You can clip an item in a flyer by just tapping it with your finger. It will go into your clippings section on the app. I look at all the flyers because I price match at my local Walmart store. 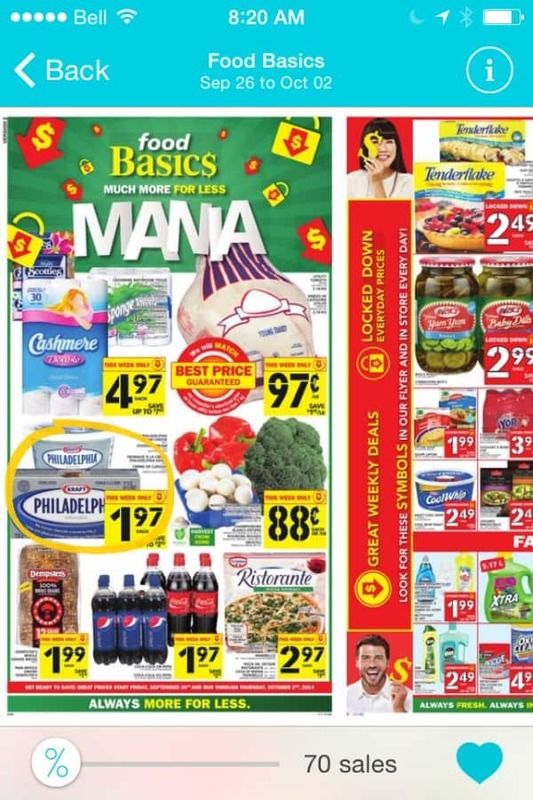 For instance, I clipped the cream cheese in the Food Basics flyer below. I price matched that product at Walmart and got it for the sale price of $1.97! I saved myself a few dollars right there. Using Flipp to price match is so much easier than carrying a stack of flyers. It can get stressful at the cash register when you are price matching. I have a couple easy tips to make the process as smooth as can be. 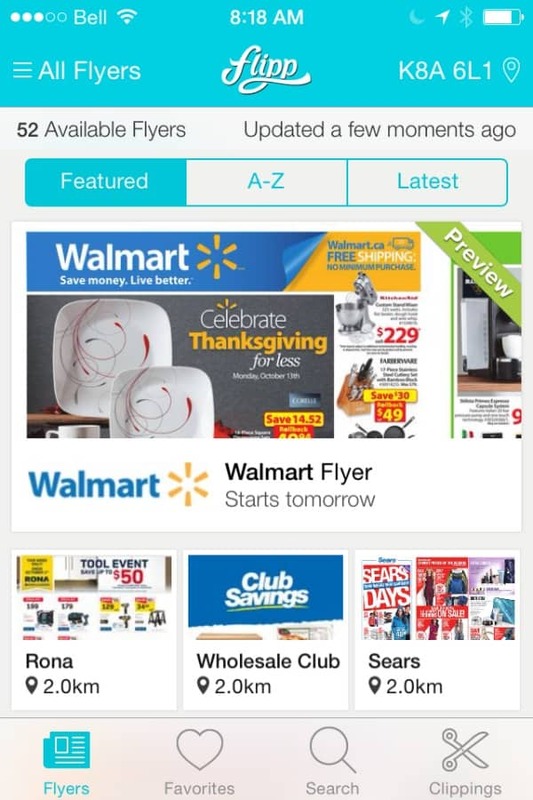 All the items you are price matching are in your Clippings on Flipp. My suggestion is to place them in the order they appear on the conveyor belt. For example, I would put all my items that aren’t being price matched on the belt first. Then I would place in same order the items appear in Flipp on the belt. In this case, the cream cheese would go first, then the Bear Paws, etc. You have to show the cashier proof of the price you are wanting to match. Pull out your smartphone and open Flipp on the Clippings section. Then show the cashier each item in Flipp. If you tap it, it will bring up the store, flyer date, price and information about the item. It goes much faster if you keep the process organized and the person behind you might not even know you are price matching! 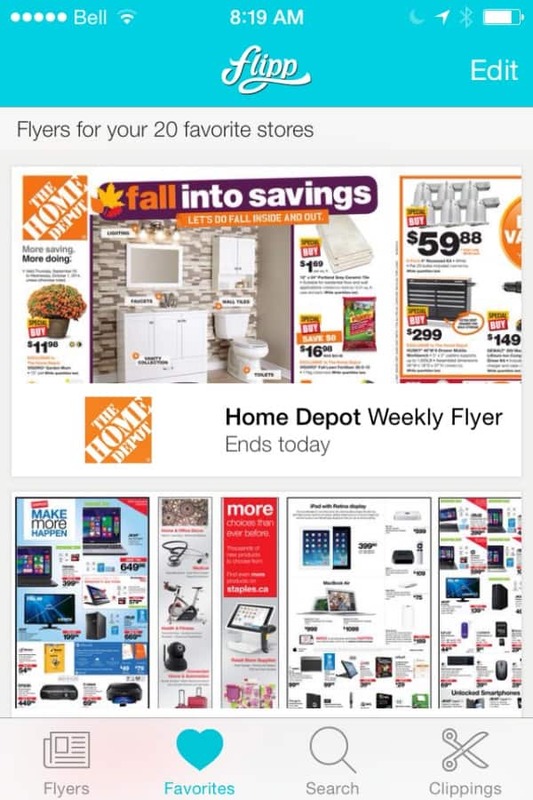 I’ve used other flyer apps and Flipp is the best one, in my opinion! I’ve been spreading the word to my friends, family members and now you. Even if you don’t use Flipp to price match, you can still use it to “shop the sales”. Flipp uses your postal code to find the best sales in your area. 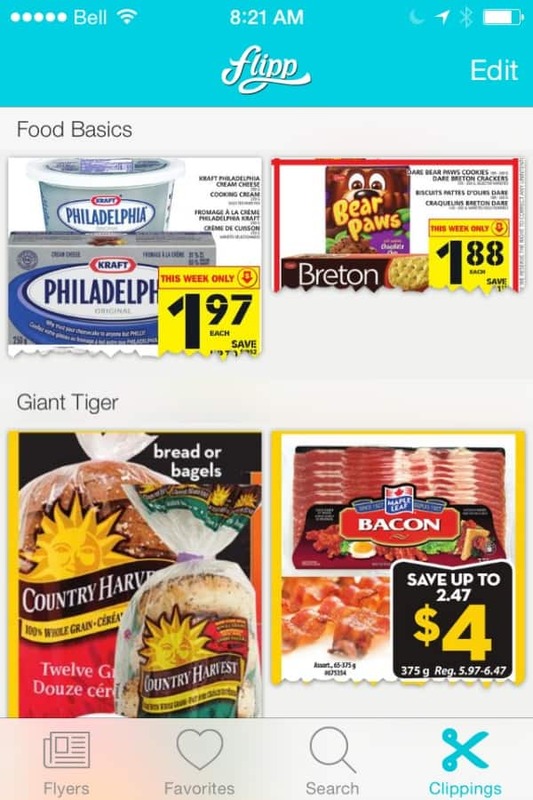 I use Flipp daily and am always checking it for previews of upcoming flyers and seeing if there are any items on my grocery list on sale that week. Thanksgiving is coming up and I’ll have a big list of things I need to buy to prepare. You can bet that I’ll be using Flipp to find the best possible sales. Every penny saved counts! Download Flipp for free on iTunes or Google Play and start saving money today. An app that helps us save money?? Yes please! I hadn’t thought of using it for price matching at the checkout! Great info, thanks! Love the idea. Really helps you find the best deal and get the best price. Plus, it’s nice that they have it all together in one spot to easily search and price match. Thank you for explaining this so well. I have heard of this app before but thought it was another one that was more of a hassle then it was worth. There are so many apps out there that claim to help but end up being more work then help. I will have to check out this app. Thank you! I love the ability to use it at the checkout. Too bad I’m not in Canada. I have this app on my tablet and I look at it every week to see the grocery store ads and see how I can save money. It is the best app for looking up ads.